Jewel House is a 4 bedroom townhouse, fully air conditioned, with private pool, conveniently located at Bella Vida Resort. 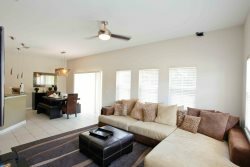 It's furnished to an extremely high standard, featuring flat screen TVs in every bedroom. It is your home away from home. A tranquil retreat after a day in the buzz of the theme parks, but close to the restaurants, bars and dinner shows near US192. I arrived after 4pm and the lock code on the door didn't work; but when I called guest services they were able to help me by resetting the code immediately. The property was more than expected my family and I enjoyed our stay. The team at The Best Vacation Homes was friendly, helpful, and very attentive to the needs of my group and the questions I had throughout the process. Tudo muito bom e tranquilo!! Enjoyable stay + The resort is nice. -In my oppinion It is far from Walt Disney World. + Nice location, villa very clean and modern. Not a bad experience but there should have been sun loungers and extra chairs. It suited my family really well. We had room to spare. The kids all stayed in one room with 3 beds and enjoyed the pool in the backyard. The grounds were nice...we just wish we had more time to enjoy them.